Gracie was chosen by our three daughters. She was the only one of the litter that was able to constantly get out of her pen...we should've known that meant she was a curious little girl. 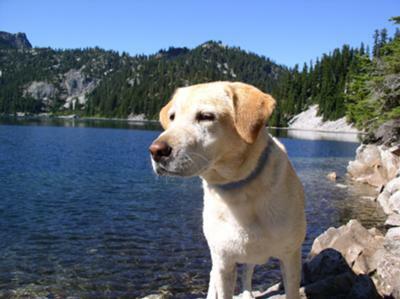 Gracie loves to swim and over the years has been on many camping trips and daily summer adventures to our nearest lake. We should've entered her in the doggie olympics, as she was easily able to leap a good 20 feet off the end of the dock. She is a frisbee lover too! At age 10, we uprooted and moved from a cooler Northwest climate to Arizona. It was a difficult transition for her, but at least we had a pool for her to swim in anytime she wanted. She has also learned to dive six feet to the bottom to retrieve her dive balls. Over the past year, she's really slowed down. She's 13 now and is becoming somewhat incontinent and isn't as smart to know to come in through the doggie door during the hot summer months to stay cool.We still walk her, but the walks have become much shorter. Not sure how much longer she'll be around, but we sure do love her and cherish every moment we have with her.